Trichoderma is a cosmopolitan fungus with a worldwide distribution. Trichoderma is a common soil, litter, and wood fungus. Indoors it has been found on various materials including paper and tapestry. Many Trichoderma species are highly cellulolytic and are main agents of decomposition. Trichoderma species have a rapid growth rate. Colonies are originally hyaline darkening to white with green tufts in most species (some species remain white, e.g. T. polysporum). Colony texture is wooly. The conidiophores are branched and hyaline. Phialides are divergent and flask-shaped. Conidia are generally green, smooth or roughened, range in shape from globose to ellipsoidal, and are produced in slimy heads. 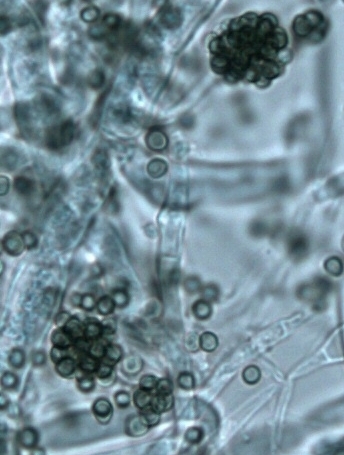 Trichoderma species are generally considered to be nonpathogenic to humans. There have been some recorded incidents of infection and peritonitis in immunocompromised individuals.